Reception is open from 8.00-20.00 pm. In an emergency case, call to out hotline (Main) 086-366-6320, 081-656-9252.
it will be charged for 200 baht/hr. 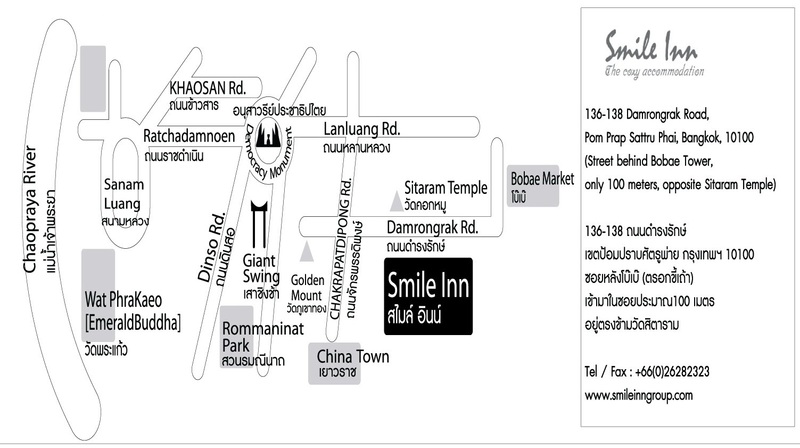 For the safety of all guests, we reserve the right to allow only registered guests to stay at SMILE INN otherwise we would charge 1,000 baht per person/night (non registred guest). For security concern, 24-hour CCTV security and electrical door are provided. According to the health and the environment, smoking in SMILE INN is not allowed. For violation, you will be fined 5,000 Baht. Do not bring any kinds of illegal weapons and materials into the building. Guest must be responsible for the damage in all cases and we do reserve the right to immediately cancel your accommodation. We do not provide safety box deposit facilities and shall not be responsible for any loss of property. Please take care of your own.